A properly designed and constructed wine room, like fine wine, is a sum of the parts. These images are of the custom wine feature awarded the Ruby Award from the ASID Gulf Coast Chapter. A standard builder issue home office was converted into this wine room with a custom metal door. Our wine rooms grace and enhance the homes of wine connoisseurs throughout greater Houston, Austin, San Antonio, Boerne, and even Crystal Beach, TX. Our principal has been designing and building custom wine features since 2005. We have created and installed gorgeous wine displays in the Perry’s Steakhouse at the Memorial City, Austin, and Katy locations as well as other restaurants in Houston and Austin. We designed and installed the wine room in the Tribute Restaurant at The Houstonian Hotel in 2018. We have a small room with samples of some of our most popular racks. This enables all clients to see and touch different racks before ordering. Access to the demo space is by appointment only. We will consult anywhere requested. A $250 non-refundable consulting fee is required at the first visit from all new clients. Traditional or contemporary wood racks. Stainless steel cables. Black metal with stainless steel. Wood and metal. Plexiglass. Custom stainless steel. Glass. Whatever your desire, we can design and build. NCV offers the CUBE wine room refrigeration system as an alternative to our traditional industry standard split system. We are the only company in Texas to offer clients this new system. It uses circulating water to keep the wine room at the correct, constant climate. It is very quiet, does not require a line-set like traditional split systems, and has a five year warranty that can be upgraded to ten years. Learn more here. This is a customizable metal & glass enclosure for wine rooms that is air-tight and uses 51mm thick glasses. It features flexible seals, continuous hinges and a dual latching system. Learn more here. This is a 21’ long wine wall. The different woods (alder and walnut) along with the curves help break up the long wall into sections. Form and Function combine to create the ultimate wine feature. Form - the CAVEA, the airtight enclosure. Function - the CUBE, the paradigm breaking wine room refrigeration system. 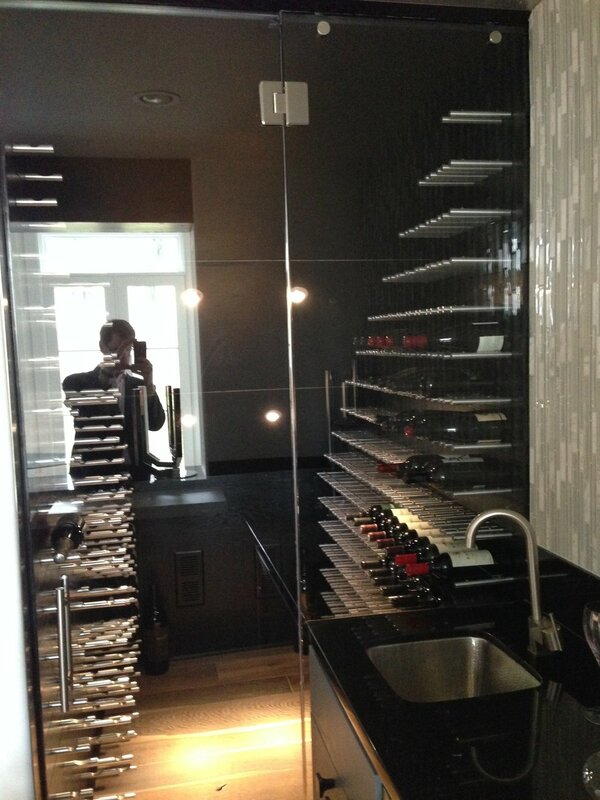 Result - the ultimate space to protect your valuable wine collection. A paradigm breaking electronic cooling system that enables the most precise and stable temperature in the wine room. A high-performance glass & metal shell that provides an air-tight enclosure and blocks harmful rays. The glass repels ultra-violet and UV rays so the building windows have no impact. We can design and build the custom wine feature of your dreams in your high-rise apartment or townhouse. Care and attention to the details make for great wine. And properly built wine storage. Copy of No visible nail or screw heads. Copy of Acrylic trays suspended on aluminum rods! Copy of Under the stairs, behind the bar. Copy of Display storage for large formats. Copy of Double deep bridge for maximum capacity. Copy of Six bottle bins. Copy of Custom metal and glass doors. A true below grade cellar in the Houston area. This wine room features custom racking made from Tigerwood. It features a double-deep waterfall, curved corners and storage for over 3,500 bottles. The climate-controlled wine area is in the cellar, next to a dining area. Before: A basic, builder-designed wine area with no refrigeration and basic wine storage. After: A climate-controlled wine feature with curved racking made from walnut and alder. The room is beneath the stairs, a few steps below grade, and had a small oddly-shaped closet on one wall. 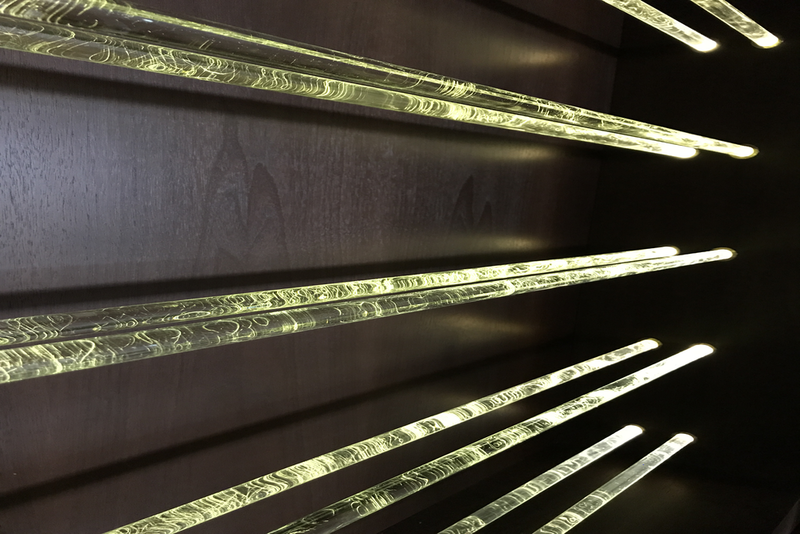 We designed the racks with a curve so that as you enter the room, your eye wants to follow the curve to see where it goes. The racks highlight and display the homeowner's collection of cult Napa cabs and his collection of large formats. The racking itself has no visible nail or screw heads. Gallery of past work including details on the design.